Placed formerly in the Chenopodiaceae family. This native plant within the Amaranth Family is found in just about all of Florida's coastal counties. If found in abundance, and it is usually NOT, strip off some leaves and bring them home. Boil them for ten minutes and eat as a salty potherb. 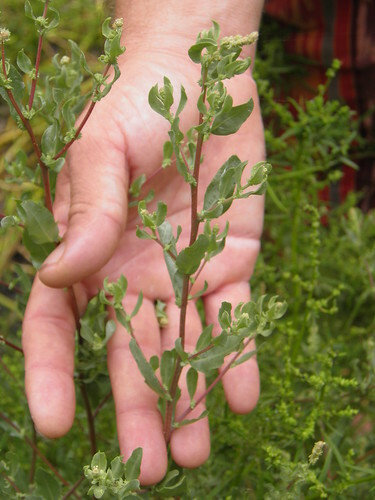 This species, along with Sea Blite - Suaeda liniaris, should be tested in saltwater aquaponics systems in my opinion, in future coastal food production systems here in Florida. Green Deane tells us that the seeds are also edible, but I have yet to try them. 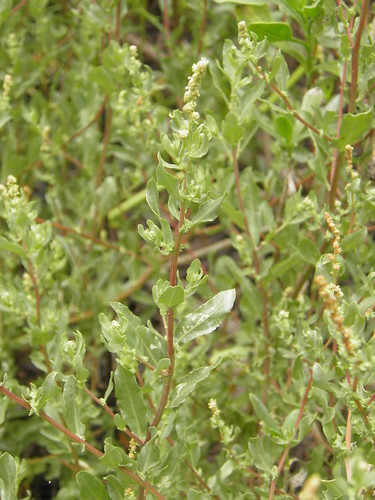 There are two other Atriplex species, rosea and tartarica, found in Florida's wilds, both being non-native. They are only found in one single panhandle county, Escambia. 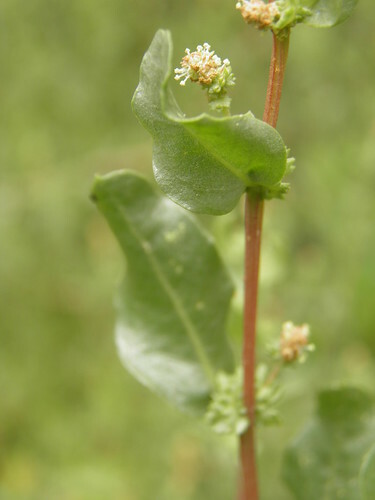 Some butterflies and moths lay their eggs on the leaves of Atriplex species. SEASON: All year in south Florida, or further north during warm winters. Cold spells kill the plants back. NATIVE TO: "Eastern and southern United States, the West Indies, Mexico, Central America (Bay Islands of Honduras) and northern South America (Venezuela)." Coastal areas north to New Hampshire, west to Texas. In Florida, most coastal counties, if not all. DESCRIPTION: Annual or perennial herb. Regional Conservation lists it as an annual. Erect or sprawling. - HEIGHT: 6-18 inches tall, often forming clumps. - BRANCHES AND STEMS: Branches many. Stems with edges. - LEAVES: Alternate, rarely opposite, “oblong, oval, or slender,”  petioles lacking or short, silvery beneath. - FLOWERS: In dense inflorescences, greenish-yellow. 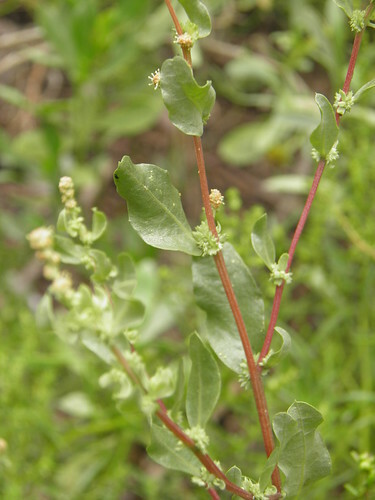 RELATED SPECIES: Two other Atriplex species grow wild in Florida. They are rare non-natives, found only in the one westernmost county of the panhandle. They are A. rosea and A. tartarica. Regional Conservation tell us that it is not cultivated. Perhaps one of us should attempt to do so.